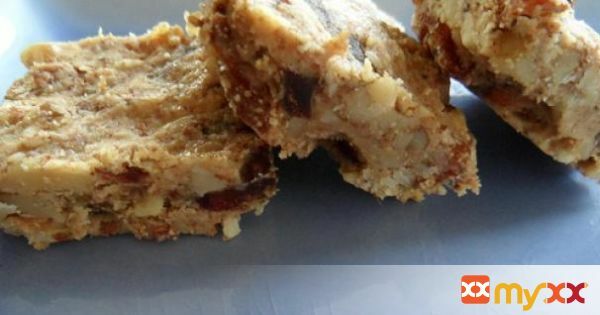 This wheat-free and sugar free energy bar recipe includes walnuts, almonds, peanut butter, apricots and dates. It is easy to make and is packed with protein and vitamins! 1. Preheat your oven to 375. Prepare a small (9 x 9) baking dish with parchment paper. 2. Using a tea kettle or a pot, bring water to a boil and fill a mug half-full with hot water. Place all of the fruit (apricots and dates) in the mug and let sit for 30 seconds to 1 minute. Using tongs (or a strainer) remove fruit from the boiling water and allow it to sit and cool. 3. Place half of the almonds and half of the walnuts in a food processor or blender. Pulse until you have a grainy nut meal. Coarsely chop the remaining nuts. Add the nut meal and chopped nuts to a mixing bowl. 4. Finely chop the fruit (pit the dates) and add to the mixing bowl. Pour the melted coconut oil (or olive oil) and vanilla extract over the nuts and fruit. Sprinkle the salt and cinnamon over the nuts and fruit. 5. Add the peanut butter and mix everything thoroughly until all ingredients are coated in peanut butter. The mixture should be somewhat sticky – if it is not, add more peanut butter (or honey if desired). 6. Pour the mixture into your parchment-lined baking dish. Using your fingers, press the mixture into the dish until evenly dispersed. Bake in the oven for 20 minutes. Remove from the oven and let sit about 30 minutes. When cool enough to handle, use the parchment paper as leverage to carefully pull out of the baking dish. Allow bars to cool in the refrigerator for at least 2 hours before cutting into squares.